Designed Exclusively for Quick, Efficient and Reliable Order Entry, Period. 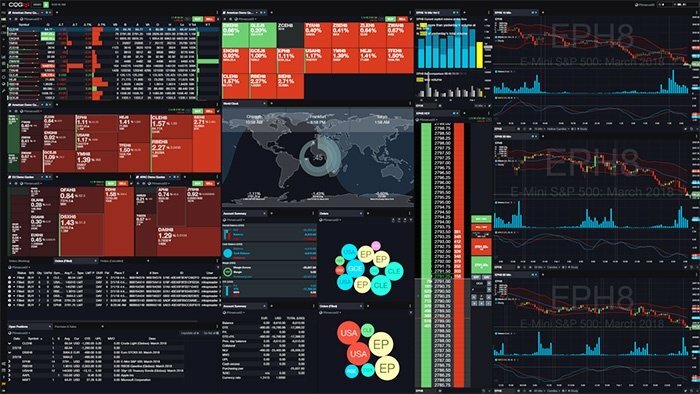 CQG Desktop is the next generation of trading and data visualization from the original data and analytics expert you’ve trusted for more than 35 years. CQG Desktop offers​ trading, market data, charting, and analytics all in one easy-to-use product that can be customized to meet your trading needs. The new web-based technology doesn’t require any software to download so it’s easier than ever to access the markets with CQG. Popular features from other CQG products have been built into CQG Desktop, making it an easy switch from CQG Trader for customers looking to take advantage of charts and better graphics, including heat maps, account monitors, and more. Leveraging HTML5 as the framework, CQG Desktop offers more options for customization, including the ability to white label and/or integrate with other applications for maximum control over accounts, risk management, and customer experience. Embed CQG Desktop within your website, customer portal, third-party news or data application, and more. We’re giving you the tools to leverage our global market coverage while still using the systems you want. Source: CQG, Inc. © 2016. In addition, CQG’s Orders and Positions window covers everything you need to know about your account and its current status. Email Spam Filters Notice & Users of Free Email Services (Gmail, Yahoo, MSN, AOL, Hotmail, etc. ): if you do not receive an email message from our server within a few minutes, it may be due to a SPAM filter blocking our email autoresponder message. Please set any spam filters you may have to accept email messages from our domain, insigniafutures.com, to ensure receipt of our demo account information. If your spam filter does block our email autoresponder message, you will need to request our demo account access again.